ROSSVILLE, Tennessee, May 3, 2011 (ENS) – Tennessee Governor Bill Haslam has his hands full dealing with the effects of severe storms and spring flooding across the state, but he took time Friday to attend the groundbreaking for the new Memphis Regional Intermodal Facility in Rossville. The $105 million facility, about 20 miles southeast of Memphis near the Mississippi border, is part of the multi-state $2.5 billion Crescent Corridor intermodal initiative. Intermodal freight transport is the movement of freight in an intermodal container or vehicle, using multiple modes of transportation – rail, ship, and truck – without any handling of the freight itself when changing modes. The goal is to establish an efficient, high-capacity intermodal freight rail route between the South and the Northeast on Norfolk Southern’s rail network that will divert long-haul trucks from interstate highways, saving fuel, reducing greenhouse gas emissions and “creating or benefiting a total of 73,000 green jobs by 2030,” the rail company said in a statement. The Crescent Corridor will be a high-capacity, 2,500 mile intermodal route from New Jersey to Louisiana that touches 26 percent of the nation’s population and 30 percent of the nation’s manufacturing output. The Crescent Corridor will provide “the shortest intermodal double-stack route between the South and the Northeast,” said Norfolk Southern. Governor Haslam joined Norfolk Southern CEO Wick Moorman and state and local officials and business and community leaders at the groundbreaking ceremony. The Memphis Regional Intermodal Facility is expected to create or enhance 6,200 jobs in the Memphis region over the next 10 years, and its capacity will grow to handle 327,000 containers and trailers annually. “The Memphis intermodal facility will be an anchor of Norfolk Southern’s Crescent Corridor rail route connecting the Northeast and Southeast with high-speed, reliable, truck-competitive intermodal services,” said Moorman. The terminal will utilize the latest in gate and terminal automation technology, which shortens the waiting time for trucks entering the terminal, reducing exhaust emissions and improving truck driver productivity. State-of-the-art, low-emission cranes will operate within the terminal. Norfolk Southern will construct the main administration building to LEED (Leadership in Energy and Environmental Design) Certification standards. The new intermodal facility will be built on 380 acres in Fayette County and is expected to open in late 2012. Tennessee state Senator Delores Gresham compared the groundbreaking to Friday’s royal wedding. “This beats any royal wedding,” the Fayette County legislator told the “Memphis Daily News” from beneath a white tent on the dirt field where the intermodal facility will rise. When the Crescent Corridor is fully operational, annual benefits to Tennessee are expected to include more than 637,000 long-haul trucks diverted to rail, more than 30 million gallons of fuel saved, carbon dioxide reduction of 336,000 tons, more than $103 million in traffic congestion savings, and an estimated $26 million in accident costs avoided. 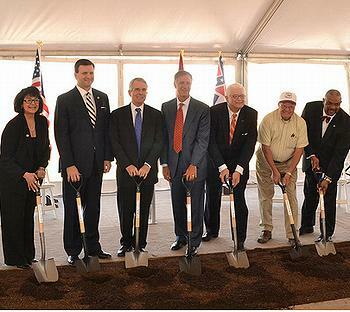 The Memphis intermodal groundbreaking is the second of four Crescent Corridor intermodal terminals to be constructed or improved over the next two years. Projects currently planned for development include new independent intermodal facilities at Birmingham, Alabama, Charlotte, North Carolina, and Greencastle, Pennsylvania; the expansion of the Harrisburg, Pennsylvania intermodal terminal; and the addition of freight rail capacity in Virginia and Mississippi.